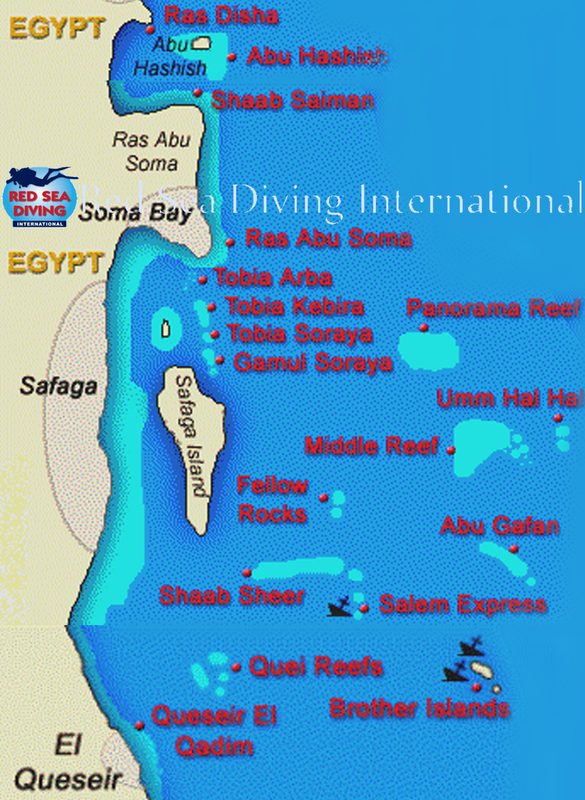 The towns of Hurghada, and Marsa Alam are major ports for some of the best liveaboard diving in the world. From Hurghada liveaboard routes include the northern reefs around Hurghada and the Strait of Gubal to the North, and the southern reefs around Hurghada and Brother's Islands to the South. From Marsa Alam liveaboard routes include Elphinstone Reef and many remote islands and reefs in the southern area of the Red Sea near the Sudan border. 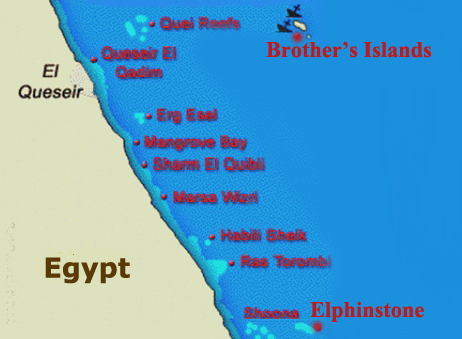 The reef at Elphinstone is one of most beautiful reefs in Egypt. 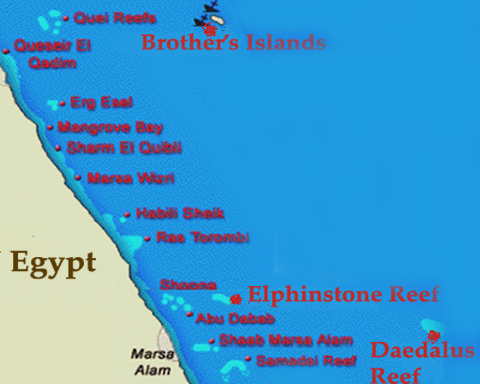 The north and the south plateaus of this reef are alone worth the visit to Egypt. At the wall and the drop off you will find a lot of spectacular colorful soft corals and also black corals. Because of the remote location of the reef you can meet the 'bigfish'. It is not unusual here to find hammerheads, grey sharks, barracudas, and dolphins. Shaab Sharm has got very steep walls, a lot of diversity and the possibility to encounter sharks and other big fish. On the East Side of the reef you will find a plateau in about 30 m depth, which is overgrown with soft corals. Here you can see schools of barracudas, snappers, and groupers. Shaab Samadai (Dolphin House): At this reef you find different diving spots - Drop offs and shallow places, one with a nice cave. The reef has a form like a horseshoe and inside the 'U', the boat has the best conditions to spend the night. In this sheltered lagoon you can often see big pods of dolphins. These animals start getting used to the diving boats, and allow snorkelers to come quite near when they are in the mood. Shaab Maksur: The south plateau offers a superb diving site. You will find here three coral pinnacles which are overgrown with red soft corals. They contain several caves and crevices where glassfish, groupers, morays and other creatures hide among the soft corals and gorgonians. Fish are also plentiful and large schools of carangids, surgeons and other small fish can be seen here. With luck you can see sharks at the edge of the plateau. Abu Galawa: Here a wreck lies in 18 m, which sank in the 50's. It is so overgrown with all kind of hard corals, that it takes a little bit of time till you recognize the bridge, rail and the funnel of the ship. The wreck is very appealing for every photographer. Also it is nice to do a night dive at Abu Galawa. With a little bit luck, you can see a Spanish dancer. Shaab Claude: This reef is fun! It has multiple caves, passages, and canyons. The underwater landscape is fantastic. Diving inside the caves at Shaab Claude is safe as they are pretty wide and spaceful. The distance between the different entrances is small and lots of shafts on the ceiling let the sunbeams illuminate the magical space. The Islands - the Big Brother and the Little Brother - are two small isolated promontories that just come out of the water in the middle of the sea at some 140 km from the coast. The Little Brother has a very high concentration of life in a very reduced area. The walls are covered literally with sponges, anemones and all sorts of soft coral alcyonarian in an astonishing variety of shapes and colors. Of course you will find plenty of fish here. It is not unusual to see sharks: hammerheads, thresher sharks, grey sharks, silvertip and whitetip reef sharks. About one km north of the Little Brother lies the Big Brother. At the west side, in the middle of the island is a lighthouse. When it is not too windy, you can proceed to dive the wreck 'NUMIDIA' which lies upon the reef on the northern side of the island between 10 and 80 m. This 150 m long ship sunk 100 years ago and is now completely covered with both hard and soft corals and gorgonians. A fantastic view! At the NW side of the island you will find another wreck, the 'AIDA'. This 82 m long steam ship sunk in 1957. The remaining pieces of the wreck are scattered all over the reef and just the back side of the hull can be found between 30 and 60 m. It is nicely overgrown and worth to visit. Because of strong current, high waves and rough seas, plus depth of the dives, it is not easy to dive at the Brother's. This safari is only for experience divers with minimum 50 dives and an Advanced Certification or higher. The Brother's Islands, tops of two undersea mountains rising from the depth, are located about 50 N.M. offshore, at the height of the town of El Quseir. A part of the Marine Park, they offer breath-taking underwater scenery, wall diving along their whole perimeter, and the possibility to spot a wide variety of pelagic. Their walls are covered in soft corals, creating a true feast for the eyes. Big tuna, shoals of jack fish and snappers cruise in the blue, accompanied by hammerheads, grey reef sharks, silver tip sharks, silky and oceanic white tip sharks and mantas. The thresher shark, an oceanic species, very rarely spotted close to reefs, circles the walls of the Brother's on a regular basis. The huge and spectacular moonfish can also be observed near the reefs. Nobody can ever get tired of diving the Brother's Islands. Even wreck lovers get spoilt on the Brothers. The Aida II, an Egyptian supply vessel, and the Numidia, a cargo ship, lie on the walls of the Big Brother. They are covered in soft and hard corals, and are a real treat. The Reef Elphinstone, a truly legendary reef, is one of the most beautiful reefs in the red sea, with its north and south plateau's, and its walls covered in soft corals, black corals, wire corals and gorgonians. Hammerheads, oceanic white tip sharks and grey reef sharks can also be spotted here on a regular basis. Because of strong current, high waves and rough seas, plus depth of the dives, it is not easy to dive at the Brother's and Elphinstone. This safari is only for experience divers with minimum 50 dives and an Advanced Certification or higher. The Islands - the Big Brother and the Little Brother - are two small isolated promontories that just come out of the water in the middle of the sea. The Brother Islands have a very high concentration of life in a very reduced area. The walls are literally covered with sponges, anemones and all sorts of soft coral alcyonarian in an astonishing variety of colors and shapes. Additionally you can dive at the Big Brother on two wrecks, the 'NUMIDIA' and the 'AIDA'. 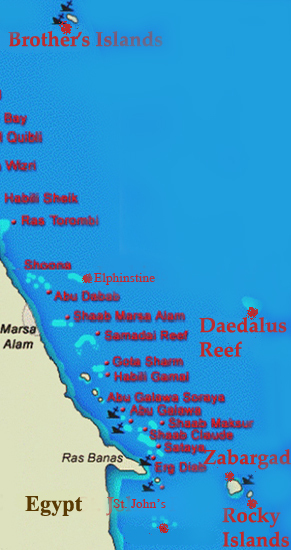 The Daedalus Reef is a huge reef formation that lies at about 180 km south of Brother's Islands. The reef is surrounded by a sheer wall all around, featuring a plateau in its southern side that goes from 30 m beside the reef to 40 m on the edge of the drop-off. If the weather is good, try to get as far north as possible and drift along one of the sides of the reef. Reef and hammerhead sharks are often spotted here. Under water life here is more abundant than anywhere else, with schools of surgeons, fusiliers, carangids and hellip. Rocky Island is a mythical site that represents the diver's dream. The fringing reef that circles the entire perimeter of the island drops steeply to an astonishing depth and the constant currents that flow all along the year favor the growth of all different kinds of life in a continuous struggle for a place on the reef. The walls are absolutely covered with the most beautiful soft corals ever found, as well as gorgonians, fans, sponges, and black coral trees. Because of its isolated situation and the reduced dimensions of the reef wall, everything seems to concentrate on the surroundings of this small islet. Reef sharks, especially greys and silvertips, you can watch in the blue and maybe manta rays, sailfish and dolphins. The Island of Zabargad is a superb dive spot. Here you can dive along walls, hover over drop offs, or dive slowly in the shallow area, watching the fish and admiring the coral garden. At the north side of Zabargad lies a nameless wreck. The 70 m long ship lies upside in 24 m depth. The whole stern section is nearly intact- stairs, rail, davit and the bridge. Because of strong current, high waves and rough seas, plus depth of the dives, it is not easy to dive at the Islands. This safari is only for experience divers with minimum 50 dives and an Advanced Certification or higher. The Brothers Islands, tops of two undersea mountains rising from the depth, are located about 50 N.M. offshore, at the height of the town of El Queseir. A part of the Marine Park, they offer breath-taking underwater scenery, wall diving along their whole perimeter, and the possibility to spot a wide variety of pelagic. Their walls are covered in soft corals, creating a true feast for the eyes. Big tuna, shoals of jack fish and snappers cruise in the blue, accompanied by hammerheads, grey reef sharks, silver tip sharks, silky and oceanic white tip sharks and mantas. The thresher shark, an oceanic species, very rarely spotted close to the reefs, circles the walls of the Brothers on a regular basis. The Aida II, an Egyptian supply vessel, and the Numidia, a cargo ship, lie on the walls of the Big Brother. They are covered in soft and hard corals, and are a real treat. The Reef Elphinstone, a truly legendary reef, is one of the most beautiful reefs in the red sea, with its north and south plateau's, and its walls covered in soft corals, black corals, wire corals and gogonians. Hammerheads, oceanic white tip sharks and grey reef sharks can also be spotted here on a regular basis. Because of strong current, high waves and rough seas, plus depth of the dives, it is not easy to dive at these dive sites. This safari is only for experience divers with minimum 50 dives and an Advanced Certification or higher. Deep, deep in the south (in the near of Rocky Island) are the St. John's Reefs. Because of the long distance, this reef group is quite virginal where you will find exciting drop offs. The wall of one of the reefs is overgrown with big gorgonians, the wall of the other reef is overgrown with all kind of colorful soft corals. You will find here a lot of fish and in the blue you can see with a little bit luck 'big fish' like hammerhead, grey sharks, silvertip and whitetip reef sharks, barracudas, tunas and mackerels. Sometimes even you can see mantas and dolphins. It is possible to reach St. John's in one week, but you are going to sail a lot (mostly in the night) and the time is very short to dive at all the reefs in St. John's. Because of the long distance, it is advisable to decide to do a 10 or 13 days safari-cruise. 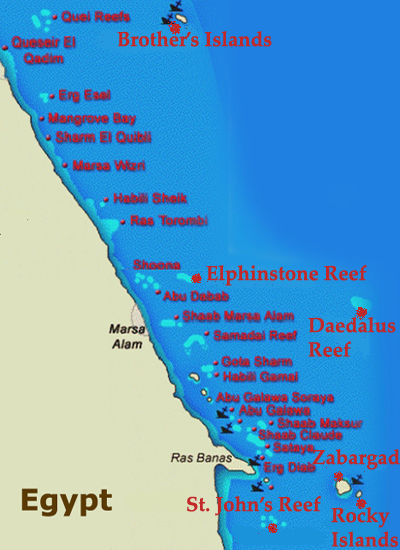 The Reef Elphinstone , a truly legendary reef, is one of the most beautiful reefs in the red sea, with its north and south plateau's, and its walls covered in soft corals, black corals, wire corals and gorgonians. Hammerheads, oceanic white tip sharks and grey reef sharks can also be spotted here on a regular basis. The Daedalus Reef is a huge reef formation that lies at about 180 km south of Brother's Islands. The reef is surrounded by a sheer wall all around, featuring a plateau in its southern side that goes from 30 m beside the reef to 40 m on the edge of the drop-off. If the weather is good, try to get as far north as possible and drift along one of the sides of the reef. Reef and hammerhead sharks are often spotted here. Under water life is here more abundant than anywhere else, with schools of surgeons, fusiliers, carangids and hellip. Rocky Island is a mythical site that represents the diver's dream. The fringing reef that circles the entire perimeter of the island drops steeply to an astonishing depth and the constant currents that flow all along the year favor the growth of all different kinds of life in a continuous struggle for a place on the reef. The walls are absolutely covered with the most beautiful soft corals ever found, as well as gorgonians, fans, sponges and black coral trees. Because of its isolated situation and the reduced dimensions of the reef wall, everything seems to concentrate on the surroundings of this small islet. Reef sharks, especially grays and silver tips, you can watch in the blue and may be manta rays, sailfish and dolphins. The Island of Zabargad is a superb dive spot. Here you can dive along walls, hover over drop offs or dive slowly in the shallow area, watching the fish and admire the coral garden. At the north side of Zabargad lies a nameless wreck. The 70 m long ship lies upside in 24 m depth. In the same strait deep in the south near Rocky Island are the St. John's Reefs . Because of the long distance, this reef group is quite virginal. You will find here exciting drop offs. The wall of one of the reefs is overgrown with big gorgonians and the wall of the other reef is overgrown with all kinds of colorful soft corals. You will find here a lot of fish and in the blue you can see hammerhead, grey reef sharks, silvertip and white tip reef sharks and barracudas, tunas and mackerels. Sometimes even you can see mantas and dolphins.